Orchid Scholarship Foundation: Orchid attempts have made impacts. 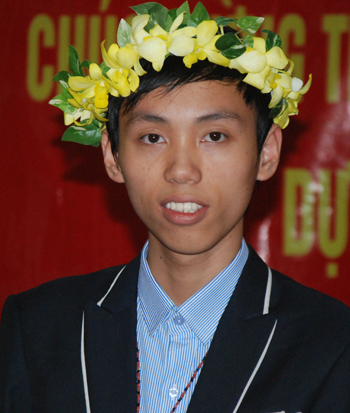 Nguyen The Hoan, who has been selected to award the Orchid Scholarship last year, has won the highest prize in the recent International Mathematical Olympiad. In his application for the Orchid Scholarship, he appreciated the supports from his family, teacher, friends and the Orchid Scholarship Foundation, as well as exhibited the dream to be a good lecturer. Below is an article about him being translated from one of the most popular online news publishers in Vietnam. On the day Mr. Hoa and his wife sent their son to Hanoi to enroll in the High School for Gifted Students (HSGS) of Vietnam National University, Hanoi, they also left their village to look for temporary jobs in Hanoi to support their son’s study. At 5 AM 14th July, the family of Nguyen The Hoan (11th grader of the HSGS of Vietnam National University, Hanoi) was eager to go to the airport to welcome him after the International Mathematical Olympiad (IMO) 2014 competition. His mother, in a white shirt, jeans and sandals, was holding a bouquet of flowers while continuously looking at the arrival gate. Meeting her son, Ms. Thach hugged him with teary eyes. “Hard-working and well-behaved children are the most valuable asset of a family”, the mother said. Hoan was born in a farming family in Hoa Binh, Hung Ha district, Thai Binh province, situated in the Northern Vietnam. Profits from a small piece of paddy rice, which is all they had, was not enough to feed the family of four, let alone to afford tuition fees and other necessary expenses for their two growing sons. Appreciating that his parents have been working very hard to afford the family, Hoan has always been very focused on his study. With natural-born talents, during the primary and secondary years, Hoan had received numerous awards for outstanding academic results, including those from the provincial level. All the walls in his small house were densely decorated with his 34 certificates and awards. After the high school entrance exams, Hoan was admitted to three prestigious schools for gifted students: HSGS of Hanoi University of Education, HSGS of Vietnam National University, Hanoi and HSGS of Thai Binh Province. Carrying the dream of studying in the same school with International Olympiad winners such as Le Hung Viet Bao, Ngo Dang Tuan…, Hoan asked his parents to allow him to go to Hanoi to continue the high school years. “My son said that in Hanoi, he would need just the same amount of food. The HSGS of Vietnam National University, Hanoi has been his long term dream. With the love for him and the wish that he would succeed in his study, my husband and I decided to go to Hanoi looking for temporary jobs”, said Ms Nguyen Thi Thach (38 years old), Hoan’s mother. The day Hoan entered high school was also the day his parents left their village to go to Hanoi to become temporary construction workers. The couples did not rent a place to stay but have been staying in temporarily tents at the construction sites. Despite their sickness or bad weather, the couples have always been at the construction sites to do their jobs. Their combined monthly salaries are about 6 to 7 million VND (about 350-400 SGD), half of which they spend on Hoan’s tuition fees and their daily expenses. The rest they send home for the grandparents to take care of the second son, a 9th grader of a gifted class specialized in Literature. With teary eyes, Ms. Thach recalled those days when Hoan skipped his breakfast to save for daily expenses. When he was sick, he didn’t inform his parents because he didn’t want them to worry for him and to spend more money on him. “Only when he had high fever with severe symptoms that his friends contacted us to bring him to the hospital for intravenous infusion”, said Ms Thach. Although his parents have been staying in temporary tents at the construction sites, Hoan has never felt ashamed about it. He even feels proud that “Everyone has their own job and I am proud of my parents who have always sacrificed for me.” International Mathematical Olympiad gold medal is a precious gift that Hoan dedicated to his parents for their sacrifice. Hearing the news that Hoan has won the gold medal, his mother burst into happy tears till she almost fainted. During that day, fellow workers at the construction site happily shared the news and admired the family. In Thai Binh province, for two consecutive days, Hoan’s grandparents were busy greeting relatives, friends and teachers who came to share the joy. The whole family was proud of Hoan and looking forward to welcoming the ‘golden’ boy in the village. Speaking of his own victory, the 11th grader of the HSGS of Vietnam National University, Hanoi just smiled gently and shared that “I am very glad to achieve my academic dream. After the exam, I thought I would only win a Silver medal, not a Gold one.” Hoan is the youngest member of the Vietnamese IMO team this year.. The competition days in South Africa, Hoan said, were tough for the Vietnam team due to unfamiliar food, time difference and cold weather of below 10 degrees at nights. However, with caring and effective measures from the training teachers, all of the team’s six contestants were healthy and comfortable during the competition. The International Mathematics Olympiad exam this year was a bit different, with more focus on combinations. However, there were still two questions about geometry, Hoan’s area of strength. “I feel very fortunate for that. When knowing that I still won the gold medal with my 29 points, I felt very happy not only for myself but also for the whole team because our achievement would also be augmented “, Hoan said. With great interest in the subject that requires continuous training of the brain since childhood, Hoan is planning to pursue Applied Mathematics as his long term career. His short term plan is to improve his English to get a scholarship to study overseas “I will try to obtain good scholarships so that my parents will not need to worry about my tuition fees and expenses”, Hoan said.